"Elite Quality Shop, a shoe store featuring a complete line of shoes for men, women and children, opened in the Curley Block at the corner of Main and Mechanic (Princess) Street in 1919. Owner Julius Starkman moved the store to the opposite corner of Main and Mechanic Streets after buying the north third of the Walton Block in 1939. Starkman died in 1956 and his widow sold the shoe store to Jack Rubenstein in 1963." - Text from calendar by Jayne M. D'Donofrio. 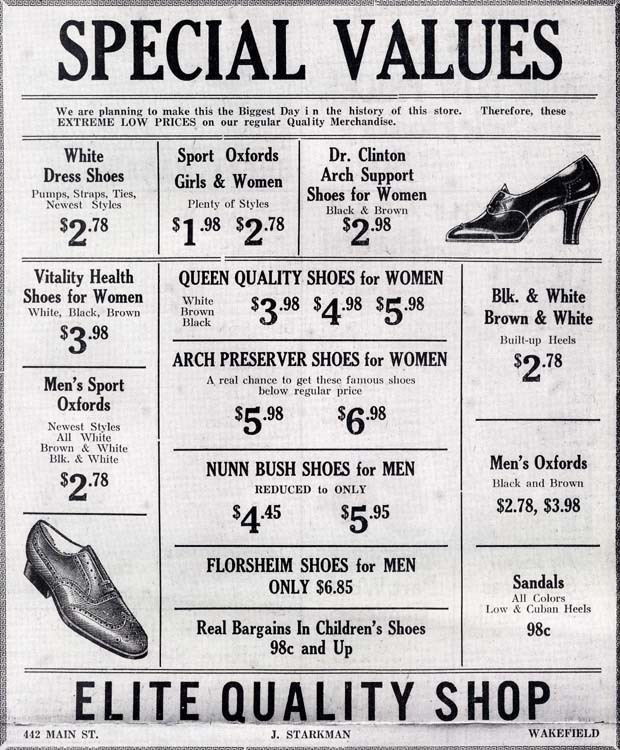 “Elite Quality Shop, 1933,” NOBLE Digital Heritage, accessed April 22, 2019, https://digitalheritage.noblenet.org/noble/items/show/6930.